Something Wrong with the System » Blog Archive » I’m now 29 (old)! I want to thank all the people who showed up for my birthday party last saturday. I had a great time, and I was drunk enough to believe you were all having fun too! 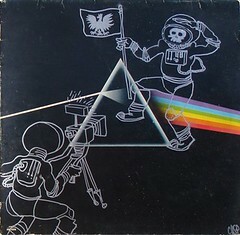 A special thanks goes out to Ron for the dead astronauts drawn onto Dark Side of the Moon! Also, I’d like to announce that Boom Blox is a great party game for the Wii!